I don’t know exactly when clutter started taking over my life, but I’ve been battling it for a while. When I saw this little book available on NetGalley, it seemed to be just what the doctor ordered. THE COVERAGE: This is more of a fun book, a flip-through, than a “sit-and-read-it” book. There are pages that have only a quote, one quick idea, or a statement of encouragement. (See the subtitle: “One-Minute Tips”.) Other pages have bulleted lists of ideas or “how to” guidelines. It covers all kinds of cleaning tips, not just de-cluttering, although that is the focus. MY TWO CENTS: This would be a great housewarming gift for someone, or a gentle push for your favorite hoarder. Some tips are really good ideas. 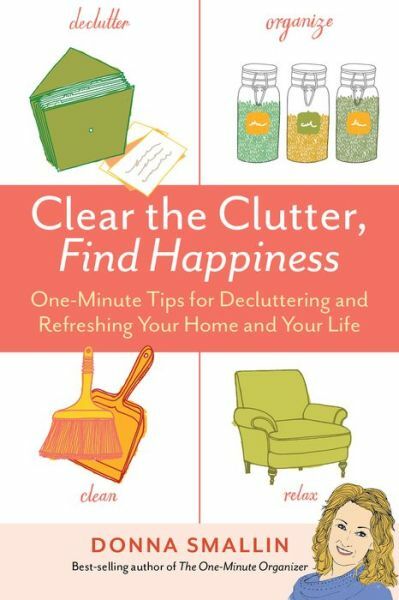 The book is aimed at making someone overwhelmed by clutter feel less guilty (THANK YOU!) and take small steps toward digging out. Some were tips I’d heard before; some were just common sense. Others were new and very helpful. And the tone throughout was encouraging and nonjudgmental. BOTTOM LINE: I’m not sure everyone would call it “good value,” but I find it very helpful. I see that this author has more books like this one, and I’ll be checking them out. Like I said, they might make great gifts! TEACUP RATING: It’s hard to give an actual teacup rating for this book, given that it’s single-page tips and not a narrative. Given that it’s a flip-through book, I’d give it maybe three-and-a-half out of five teacups. ON SALE DATE: The book will be available in paperback and ebook formats on December 16, 2014.